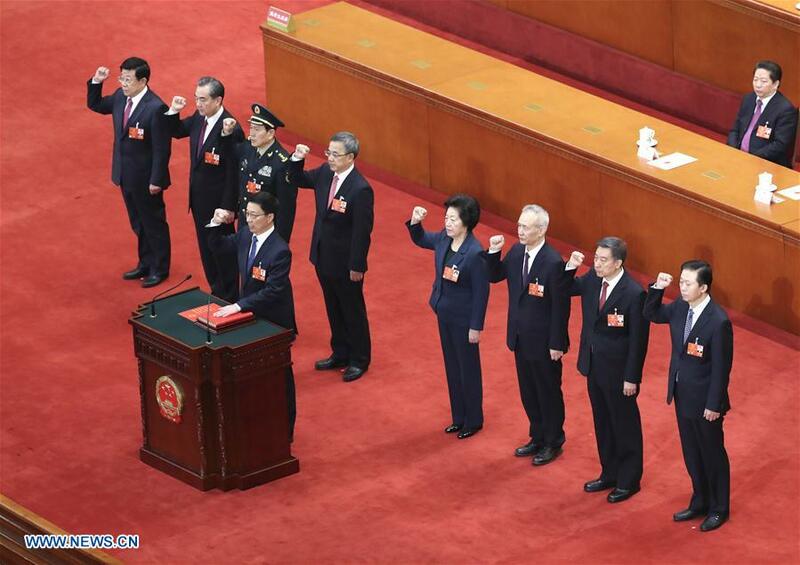 BEIJING, March 19 (Xinhua) -- The 13th National People's Congress (NPC), China's national legislature, decided on the new lineup of the State Council at the seventh plenary meeting of its first session Monday morning. Chinese leaders including Xi Jinping, Li Keqiang, Li Zhanshu, Wang Yang, Wang Huning, Zhao Leji, Han Zheng and Wang Qishan attended the plenary meeting. They were officially appointed after President Xi Jinping signed a presidential decree. All of them took oath of allegiance to the Constitution afterwards.